If your child attends daycare, he or she probably catches the cruddy cold, runny nose, and cough more often than a loving parent could have ever imagined. Whenever children are together in a shared common space, the germs will pass at an alarming speed, the most common is the common cold (Rhinovirus). According to the CDC, “Common colds are the main reason that children miss school and adults miss work each year in the United States; there are millions of cases of the common cold with adults having an average of 2-3 colds per year, and children have even more” (CDC, 2017). While the cold is transmitted through both contact and airborne, there are several steps parents can take to decrease the chance of the spread from daycare to home. “Though you can’t protect your child from every virus he or she encounters, these healthy habits can increase his or her resistance” (Moninger, 2017). Wash hands frequently with warm water and soap. This will not inactivate the Rhinovirus, but will rid the hands of it. Keep your home clean by regularly disinfecting light switches, door knobs, and other areas prone to a high volume of contact which increases the spread of germs. Keep hand sanitizer in your car to use when leaving the daycare facility. This will help eliminate germs from getting into your car. Teach children at a young age appropriate sneezing and coughing techniques. Keeping children active will boost their immune system. “Exercise causes changes in antibodies and white blood cells (WBC), WBCs are the body’s immune system cells that fight disease” (Medline Plus, 2017). Upon arriving home, immediately have children shower and brush teeth or have fresh play clothes ready and wash hands as soon as they enter the home. Since the Rhinovirus is transmitted through close contact, this measure will ensure that when another family member hugs the child who attends daycare, he or she will not come into contact with contaminated clothing. Making sure your child gets enough sleep. Healthy eating for your child is one of the most important aspects of preventative care a parent can take. “Lowered immune function may result in an increase in acute illnesses such as colds and the flu” (Diagnose-Me.com, 2017). With proper nutrition for your child, the immune system will build up. A child with a lowered immune system is more susceptible to infection. Thus, feeding children a healthy, balanced diet to include all of the food groups, in proportion of the child’s age, will result in a nurtured immune system. Staving off a cold is imperative, as often times the cold can turn into the flu or a super cold. 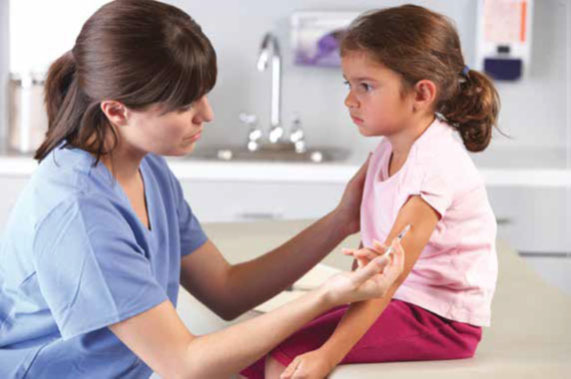 A good preventative measure for children is the flu shot. Parents can have their child receive this vaccine at an early age. However, the vaccine should be given annually as the cold and flu virus mutates. According to the CDC, “Some children 6 months through 8 years of age require two doses of influenza vaccine. Children 6 months through 8 years getting vaccinated for the first time, and those who have only previously gotten one dose of vaccine, should get two doses of vaccine this season” (CDC, 2017). The first dose should be given as soon as the vaccine becomes available at your pediatrician’s office. Sun Life Family Health Center welcomes you to learn more about our pediatric services. Sun Life offers continuous and comprehensive healthcare to individuals and the entire family. In addition to providing care when you are ill, we will also help you achieve a healthy lifestyle and work with you to help prevent illnesses. Flu Season is Here! Is Your Family Ready? Be Proactive! Get the Flu Shot Now. For more information call our Maricopa Family Practice location today at (520) 568-2245. Create a Germ Free Drop Zone near the entrance of your home to drop back-packs, sanitize hands, and change clothes. This will decrease significantly the spread of daycare germs throughout the house.